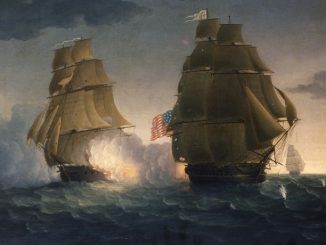 During the War of 1812, much of the action at sea had less to do with the navies of either Britain or the United States fighting one another and much more to do with those navies playing merry hell with one another’s trade. Because of this, new guidelines were developed by Britain for interviewing the crews of captured vessels. The text gives great insight into the practical concerns of a navy charged with protecting its country’s economic security. To be administered on behalf of Our Sovereign Lord George the Third, by Grace of God, of the United Kingdom of Great Britain and Ireland, King, Defender of the Faith. To all Commanders, Masters, Officers, mariners, and other Persons found on board any Ships and Vessels, which may have been, or shall be seized or taken as Prize by any of His Majesty’s Ships or Vessels, which have or shall have Commissions or Letters of Marque and Reprisals, concerning such captured Ships, Vessels, or any Goods, Wares, and Merchandizes on board the same; examined as Witnesses in preparatory during the present hostilities with the United States of America. Let each witness be interrogated to every of the following Questions; and their answers to each Interrogatory written down. Where were you born, and where have you lived for these seven years past? Where do you live? and how long have you lived in that place? To what Prince or State, or to whom are you, or have you been a subject, and of what Cities or Towns have you be en admitted a Burgher or Freeman, and at what time and in what manner were you so admitted? How long have you resided there since you were admitted a Burgher or Freeman, or where have you resided since? What did you pay for your admission? Are you a married man, and if married, where do your wife and family reside? Were you present at the time of the taking and seizing the ship or her lading, or any of the goods or merchandizes concerning which you are now examined, and Commission? What and from whom? In what place, Latitude, or port, and in what year, month, day, was the ship and goods, concerning which you are now examined, taken and seized? Upon what pretence and for what reasons were they seized? Into what place or port were they carried, and under what colours did the said ship sail? What other colours had you on board, and for what reason had you such other colours? 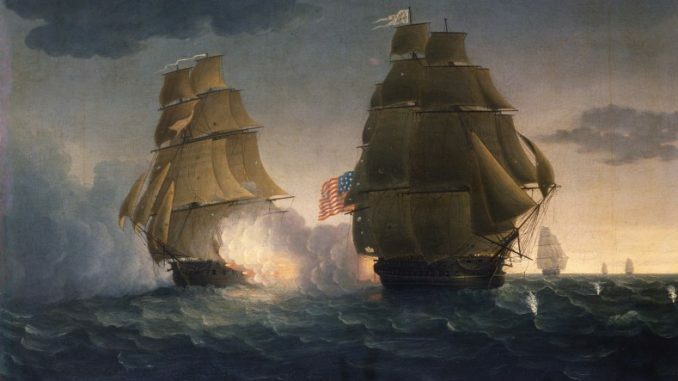 Was any resistance made at the time when the said ship was taken; and if yes how many guns were fired, and by whom, and by what ship or ships were you taken? Was such vessel a ship of war, or a vessel acting without any Commission as you believe? Were any other, and what ships, in sight at the time of capture? What is the name of the Master or commander of the Ship or Vessel taken? How long have you know the said Master, and who appointed him to Command of the said ship? Where did such Master take possession of her, and at what time, and what was the name of the person who delivered the possession to the said Master? Where doth he live? Where is the said Master’s fixed place of abode? If he has no fixed place of abode, then let him be asked, Where was his last place of abode, and where does he generally reside? How long has he lived there? Where was he born , and of whom is he now a subject? Is he married, if yes, where does his wife and family reside? Of what tonnage or burthen is the Ship which has been taken? 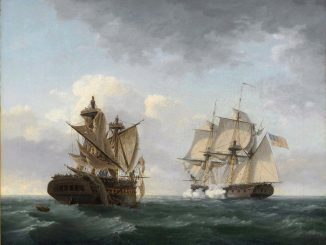 What was the number of Mariners, and of what country were the said Seamen or mariners? Did they all come on board at the same port, or at different ports, and who shipped or hired them, and when and where. Had you, or nay of the Officers or Mariners belonging to the said Ship or Vessel. concerning which you are now examined, any and what part, share or interest in the said Ship or her Lading? If yes, set forth who and what goods or interest you or they have? Did you belong to the said Ship or vessel at the time she was seized and taken? In what capacity did you belong to her? How long have you known her? When and where did you first see her, and where was she built? What is the name of the Ship? How long has she been so called? Do you know of any other name or Names by which she has been called; If yes what were they; Ha s she any Passport or Sea brief on board, and from whom? To what Ports or Places did she sail during her said Voyage before she was taken? Where did her last Voyage begin, and where was the said Voyage to have ended? Set forth the quality of every cargo t he ship has carried to the time of her capture from the time you have known her, and what ports such cargoes have been delivered at? From what Ports and at what time, particularly from the last clearing Port, did the said Ship sail, previously to the capture? Under whose direction and management has she usually been, with respect to her employment in Trade? With whom do you correspond on concerns of the Vessel and her cargoes? I what country was she built, as far as you know, or have reason to believe? What Lading did the said Ship carry out at the time of her first setting sail on her last voyage, and what particular sort of Lading and goods had she on board at the time when she was taken? In what year and in what month was the same put on boar d? set forth the different species of Lading, and the Quantities of each sort. Who were the Owners of the Ship or Vessel, concerning which you are now examined, at the time when she was seized? How do you know that they were the Owners of the said Ship at that time? Of what Nation or Country are such Owners by birth? Where do they reside, and where do their Wives and Families reside? How long have they resided there? where did they reside before, to the best of your knowledge? To whom are they Subjects? Was any Bill of sale made, and by whom, to the aforesaid Owners of the said Ship; and if any such was made, in what month and year? Where, and in the presence of what Witnesses, was such Bill of Sale made? Was any and what engagement entered into concerning the Purchase further than what appears upon the Bill of sale? If yes, was it verbal or in writing? Where did you last see it? and what has become of it? Was the said Lading put on board in one Port and at one time, or at several Ports and at several times, and at what Ports, by name? Set forth what quantities of each sort of Goods were shipped at each Port. What are the names of the respective Laders or Owners, or Consignees, of the said Goods? What Countrymen are they? Where do they now live and carry on their business or trade? How long have they resided there? And where were the said Goods to be delivered, and for whose real account, risk or benefit? have any of the said Consignees or laders any, and what Interest, in the said goods? If yes, whereon do you found your belief that they have such Interest? Can you take upon yourself to swear that you believe, that at the time of the lading the Cargo, and at the present time, and also if the said Goods shall be restored and unladen at the destined Ports, the Goods did, do and will belong to the same Persons, and to none others? What is the ground of your knowledge or belief? How many Bills of Lading were signed for the Goods seized on board the said S hip? Were any of those Bills of Lading false or colourable, or were any bills of Lading signed which were different in any respect from those which were on Board the Ship, at the time she was taken? What were the contents of such other Bills of Lading, and what became of them? Are there, in Great Britain, any Bills of Lading, Invoices, Letters or Instruments, relative to the Ship and Goods, concerning which you are now examined? if yes, set forth where they are, and in whose possession, and what is the purport thereof, and when they were brought or sent into this Kingdom? Was there any Charter-Party signed for the Voyage in which the Ship, concerning which you are now examined, was seized and taken? What became thereof? When, where and between whom, was such Charty-Party made? What were the contents of it? What Papers, Bills of lading, Letters, or other Writings, were on board the Ship at the time she took her departure from the last clearing Port, before her being taken as Prize? Were any of them burnt, torn, thrown over board, destroyed or cancelled, concealed or attempted to be concealed, an when, and by whom, and who was then present? Has the ship, concerning which you are know examined, been at any time, and when seized as prize, and condemned as such? If yes, set forth into what port she was carried, and by whom and by what authority, or on what account was she condemned? Have you sustained any loss by the seizing and tasking the ship, concerning which you are know examined? If yes, in what manner do you compute such, your loss? have you already received any indemnity, satisfaction, or promise of satisfaction, for any part of the damage which you have sustained, or may sustain by this capture and detention, and when, and from whom? Is the said Ship or Goods, or any, and what part, insured? If yes, for what Voyage is such Insurance made, and at what premium, and when and by what Persons, and in what Country was such Insurance made? In case you had arrived at your destined Port, would your Cargo, or any Part thereof, on being unladen, have immediately become the property of the consignees or any other Person, and whom? Or was the Lader to take the chance of the Market for the Sale of his Goods? Let each Witness be interrogated of the Growth, Produce, and manufacture of what Country and place was the lading of the Ship or Vessel, concerning which you are know examined, or any part thereof? Whether all the said Cargo, or any part thereof, was taken from Shore or Quay, or removed or trans shipped from one Boat, Barque, Vessel or Ship, to another? From what and to what Shore, Quay, Boat, Barque, Vessel, or Ship, and when and where, was the same so done? Are there in any Country, besides Great Britain, and where, or on board any and what Ship or Ships, Vessel or Vessels, other than the Ship and Vessel, concerning which you are now examined, any Bills of Lading, Invoices, Letters, Instruments, Papers, or Documents, relative to the said Ship or Vessel and cargo, and of what Nature are such Bills of lading, Invoices, Letters, Instruments, Papers, or Documents, and what are the Contents? Were any Papers delivered out of the said Ship or Vessel, and carried away in any manner whatsoever? And when and by whom, and to whom, and in whose custody, possession, or power, do you believe the same now are? Was Bulk broken, during the Voyage in which you were taken, or since capture of the said Ship? And when and where, by whom, and by whose orders? And for what purpose, and in what manner? Were any Passengers on board the aforesaid Ship? Were any of then secreted at the time of Capture? Who were the Passengers by name? Of what Nation, rank, profession, or occupation? Had they any Commission? For what purpose, and from whom? From what place were they taken on board, and when? To what place were they finally destined, and upon what business? Had any, and which, of the Passengers any and what property or concern, or authority, directly or indirectly, regarding the Ship and Cargo? Were there any Officers, Soldiers or Mariners, secreted on board, and for what reason were they secreted? Were any of His Britannic Majesty’s Subjects o n board, or secreted or confined at the time of capture? How long and why? Were, and are, all the Passports, Sea Briefs, Charter-Parties, Bills of Sale, Invoices and Papers, which were found on board entirely true and fair? Or are any of them false or colourable? Do you know of any matter or circumstance to affect their credit? Were they obtained for this ship only? And upon what oath, or affirmation of the persons therein described, or were they delivered to, or on behalf of the person or persons who appear to have been sworn or to have affirmed thereto, without their having ever, in fact, made any such oath or affirmation? How long a time were they to last? Was any duty or fee payable and paid for the same? And is there any duty or fee to be paid on the renewal thereof? Have such Passports been renewed, and how often? And has the duty or fee been payable for such renewal? was the Ship in a Port in the Country where the Passports and Sea Briefs were granted? And if not, where was the Ship at t hat time? had any person on board any Let-Pass or Letters of Safe-conduct? If yes, from whom and for what business? If it should appear that there are in Ireland, or the British American Colonies, or in any other Place or Country, besides Great Britain, any Bills of Lading, Invoices, Instruments, or Papers relative to the Ship and Goods, concerning which the Witness is now examined:- Then Interrogate, hoe were they brought into such a Place or Country? In whose possession are they, and do they differ from any of the Papers on board, or in great Britain, or Ireland, or elsewhere, and in what particulars do they differ? Have you written or signed any Letters or Papers, concerning the Ship and her Cargo? If yes, what was their Purport? To whom were they written and sent, and what is become of them? Towards what Port or Place was the Ship steering her course at the Time of her being first pursued and taken? Was her Course altered upon the appearance of the Vessel by which she was taken? Was her Course at all times, when Weather would permit, directed to the Place or Port for which she appears to have been destined by the Ship Papers? Was the Ship before, or at the time of her capture, sailing beyond, or wide of the said Place or Port to which she was so destined by the said Ship Papers? At what distance was she therefrom? Was her course altered at any and, at what time, and to what other Port or Place, and for what reason? By whom, and to whom hath the said Ship been sold or transferred, and how often? At what time and at what place, and for what sum or consideration, hath such sum or consideration been paid or satisfied? Was the sum paid, or to be paid, a fair and true equivalent? Or what security, or securities, have been given for the payment of the same, and by whom, and where do they live now? Do you know or believe in your conscience, such sale or transfer has been truly made? And for the purpose of covering or concealing the real property? Do you verily believe that if the Ship should be restored, she will belong to the persons now asserted to be the Owners, and to none others? Are there any private Agreements for the return of the Ship to her former Owners at the conclusion of the war, or at any other period? What Guns are mounted on board the Ship, and what arms and Ammunition were belonging to her? Why was she so armed? Were there on board any other Guns, Mortars, Balls, Shells, Handgranades, Muskets, Carbines, Fuzees, Halberts, Spontoons, Swords, Bayonets , Locks for Muskets, Flints, Ram-rods, Belts Cartridges, Cartridge-Boxes, Pouches. Gun-Powder, Salt Petre, Nitre, Camp Equipage, Military Tools, Uniforms, Soldiers Clothing or Accoutrements, or any sort of Warlike or Naval Stores? Were any such Warlike or Naval Stores, or things, thrown overboard, to prevent suspicion at the time of the Capture? And were, and are any such Warlike Stores, before described, concealed on board under the Name of Merchandize, or any other colourable appellation, in the Ships Papers? If yes, what are the marks on the Casks, Bales, and Packages, in which they were concealed? Are any of the before-named articles, and which, for the sole use of any Fortress or Garrison in the Port or Place to which such a Ship was destined? Do you know or have you heard of any Ordinance, Placart, or law existing, in such Kingdom or State, forbidding the Exportation of the same by private persons without a Licence? Were such Warlike or Naval Stores put on board by any Public Authority? When, and where, were they put on board? What is the whole which you know or believe, according to the best of your knowledge and belief, regarding the real and true property and destination of the Ship and Cargo concerning which you are now examined, at the time of Capture? 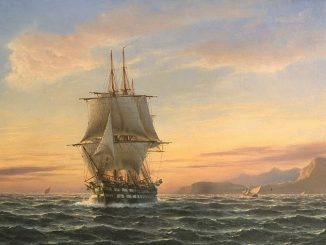 Did the said Ship, on the Voyage in which she was captured, or on, or during any, and what former Voyage or Voyages, sail under the Convoy of any Ship or Ships of War, or other armed Vessel or Vessels? If yes, Interrogate for what reason, or purpose, did she sail under such Convoy? Of what force was or were such convoying Ship or Ships? And to what State or Country did such Ship or Ships belong? What Instructions or Directions had you, or did you receive on each and every such Voyages, when under Convoy, respecting your sailing or keeping in company with such armed or convoying Ship or Ships, and from whom did you receive such Instructions or Directions? had you any and what Instructions or directions, and from whom, for resisting or endeavouring to avoid or escape from capture, or for destroying, concealing, or refusing to deliver up your Ship’s Documents and Papers? Or any and what other papers, that might be , or were put on board your said Ship? If yes, Interrogate particularly as to the Tenor of such Instructions, and all particulars relating thereto? let the Witness be asked if he is in possession of such Instructions, or Copies thereof, and, if yes, let him be directed to leave the same with the Examiner, to be annexed to his deposition. Did the said Ship, during the voyage in which we was captured, or on or during any and what former voyage or Voyages, sail or attempt to enter any Port under Blockade by the arms or Forces of any, and which of the Belligerent Powers? If yes, when did you first learn or hear of such Port being so blockaded, and were you at any and at what time, and by whom warned no to proceed to, or to attempt to enter such blockaded Port? What Conversation or other Communication passed thereon? And what course did you pursue upon, and after, being so warned off.